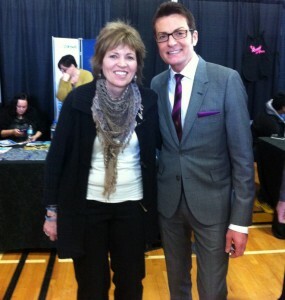 At the EPIC Eventz Bridal and Event Extravaganza on March 2, at the Peterborough Sports and Wellness Centre we had a chance to meet and talk with the one and only Randy Fenoli. What a great guy, he told us a little about the new season of “Say Yes to the Dress” and about his passion for weddings. This coming season you can expect more drama, beautiful gowns, and of course more Randy! Randy said it is his extreme pleasure to help brides find the perfect dress for their big day, and helping Peterborough brides made him smile. Randy had a blast and was kind enough to pose for a picture with Her Wedding Planner and Peterbrough Wedding Planner website creator Chantal Patton. Thank you Peterborough for coming out and attending the bridal show. We sincerely hope that you found everything to help make your dream day come true!